Vladimir Putin took part in the ‘Immortal Regiment’ march in Moscow. 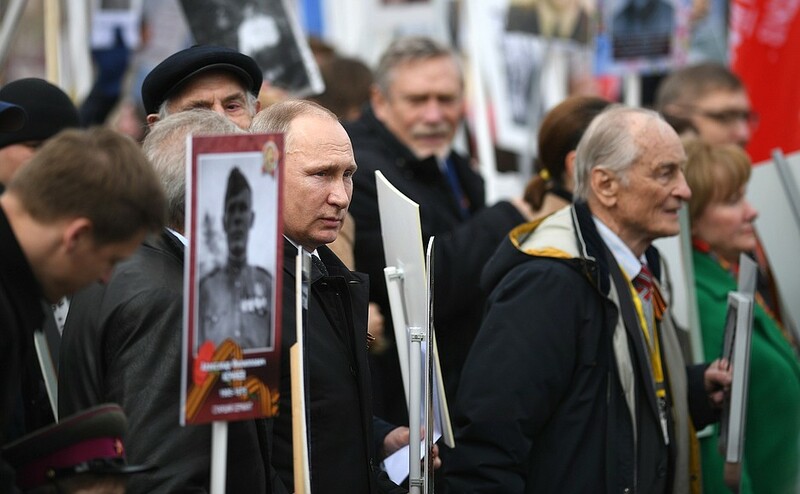 Russian President Vladimir Putin took part in the ‘Immortal Regiment’ march in Moscow to commemorate those who fought or died in the Soviet Union’s Great Patriotic War against Nazi Germany in 1941-1945, TASS reports. Putin took part in the 'Immortal Regiment' march for the third time. For Putin, like for an absolute majority of Russians, the Great Patriotic War of 1941-1945 is a part of his family’s history. As Putin used to recall, his father, Vladimir Spiridonovich Putin, went immediately to the front after the war broke out where he fought and was heavily wounded near blockaded Leningrad. The head of the Russian state also frequently recalls his mother, Maria Ivanovna, who lived through the Leningrad blockade, and his senior brother who died from diphtheria in 1942. The Immortal Regiment public event was first held in the Siberian city of Tomsk in 2012. In 2013, it was already held in 120 cities, and in 2014, in 500 cities and towns in seven countries. The action officially became all-Russian since 2015.